The Meizu m1 mini has finally been revealed to us in full after only catching glimpses of it for some time. A photo has popped up on Chinese social network Weibo with the m1 mini pictured next to the existing m1 note. The 5-inch screen was already confirmed and now we see exactly how much smaller the mini looks in real life, compared to the 5.5-inch m1 note. The curious bit about this image is that the m1 minis aren't running the company's proprietary Flyme OS Android overlay, unlike the m1 note beside them. The device in the middle shows a stock Android homescreen, while the right m1 mini appears to be running Yun OS, another Chinese take on Android. This goes in line with previous news, stating the Meizu m1 mini will be a multi OS device, coming with your choice of Meizu's Flyme OS, Yun OS, developed by Alibaba, and Ubuntu. The stock Android version was unexpected and it remains to be seen whether it will be another option to purchase, or is a pre-production model for development purposes. 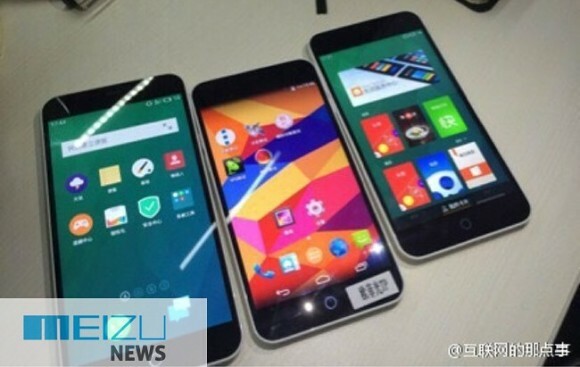 Either way, the Meizu m1 mini is expected to be unveiled on January 28 at the company's "Connected" event.